Without any mindfulness meditation techniques life can be very difficult, especially right now on this planet. There is no financial security. Jobs come and go. Health security—a joke (well, at least, here in America). Relationships are more like the stock market with constant trading. And who knows what is going on with the environment! Look all around you and you will see people very stressed, very afraid. There is nothing secure anywhere in the world. I once had a dream with the Dalai Lama and I asked him where there was a safe place on this planet during this time of great change. “There is no safe place,” he said with his famous smile. However, there is a way out (or should I say, a way in). That is meditation. I do not know how people can get by without having mindfulness meditation techniques? I am over 55 years old and I have been practicing meditation for half of that time. Has it prevented me from suffering? Not the least. But it has led me to a mindfulness, an inner peace, that can watch without judgment whatever happens to ‘me.' So even if my body is going through some rough times, and events are not going the way as planned, there is always this core happiness inside. Life has become a wonderful adventure. Okay, so what is the best meditation technique? I do not know about you, but I am lazy and I like things simple. I also like a variety. So what you will find on this site is a variety of meditation techniques. For me, the best meditation technique is one that brings me to a transpersonal Awareness of who I AM. It needs to be simple so I can do it on my own and anytime, anywhere. It also needs to be effective so I can see some results. To fit that criteria, most of these meditation techniques you will find on this site will focus on rediscovering one’s Being, on coming to the Present Moment, the Now. They can assist you in becoming mindful of your thoughts, which, for most of us, are like swirling fall leaves kicked up by a tempest. And by being mindful of your thoughts, you will find your thoughts becoming less and less, and you will then be more aware of the Consciousness that pervades all things. Some of these meditations techniques will be from the Hindu meditation tradition, others the Buddhist, some the Christian, and others from the broad category of New Age. These are all traditions I have worked with and love deeply. Are there other types of meditation techniques on this site other than the mindfulness type? All of the above that I have mentioned can be yours. You can be a better, more complete human being, living out your potential. Your body, mind and spirit can be completely aligned. And you can achieve unconditional happiness. Will the journey be easy? Most likely not. The mind is the most powerful tool in the universe. And for most of us, it has been the master, and an unruly one at that. But here is a secret: If you can be gentle with yourself in regards to practicing your meditation technique. If you have no judgment about how successful or not you are in achieving any of those benefits; in fact, not even worrying about whether you will achieve anything at all. If you can enjoy all the ups and downs of the journey. Then, guess what? You have already arrived at a place where few have come to. I am certain you will find the right mindfulness meditation technique for your spiritual awakening. The mission of Mindfulness-Meditation-Techniques.com is not only to provide a variety of effective meditation techniques to help you become more aware of the Divine Being that you are, but also to provide an exposure to a variety of modalities that integrate spirit, mind and body, as well as offer writings and images that inspire and awaken. Secondly, I hope that this site is a place where you and others will contribute. I love to interact. If you have questions and/or answers, observations, feedback, experiences, techniques, etc. There are many pages on this site that allow you to contribute in an easy and attractive way. So come on in and help make this site a great one. P.S. To make this site as attractive and one that induces a quiet mind, reflective mind, I have removed all those annoying ads that seem to know just what you desire (weird how that is). What you will find are my books, whether ebook or paper, that you can order through Amazon. And since you are drawn to this site I think you might find them of interest. Answers to questions about the basics of meditation techniques and mindfulness. India has long been known for its wisdom. A variety of Hindu meditations offer powerful spiritual tools for those learning meditation. Here you will find New Age meditations and affirmations to find your own individual pathway during this time of planetary transformation. Connect with the Ascended Masters and the great I AM. While mindfulness meditation techniques are generally associated with the East, there has been a long tradition of Christian meditations. Find a Buddhist meditation to help you to live a life of mindfulness. The body mind connection is the basis for holistic healing. Less stress creates better health. Here you will find meditation in movement, where body, mind, and spirit are in alignment. Meditation mantras, invocations, listening to nature sounds, all become a meditation sound that lead to a quiet peace of mind. Pilgrimage to sacred sites, or power spots, can greatly enhance one's meditation. Here you will find a collection of spiritual articles to meditate upon to help you in remembering who you are and in living a life of fulfillment. Inspirational poetry aims at describing the indescribable. Here you will find many offerings to the Beloved. Inspirational quotes and other words of wisdom to meditate upon and to help you direct your focus to a life of happiness. These inspirational stories offer wisdom for your spiritual journey. An overview of Janaka Stagnaro's spiritual journey and the teachers, teaching and meditation techniques along the way. 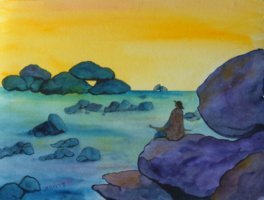 Janaka's inspirational books, "Footprints Along the Shore of an Incoming Tide" and "Silent Ripples" are works that will uplift one's spirit and reveal one's true nature. Spiritual counseling, including: meditation techniques, mantra meditations, tarot readings, positive affirmations, invocations, holistic parenting and more. Spiritual counsel. Free advice with: meditation techniques, relationships, holistic parenting, the spiritual journey and more. Some testimonials about Janaka Stagnaro and his work as spiritual mentor, tarot reader, writer and artist. How to contact Janaka Stagnaro. Inspirational books can be great friends on the spiritual journey. But there are so many to choose from. Check out these recommendations to help you on your way. Links to quality sites that focus on wisdom and care for body, mind and spirit. All the artwork you will see on this site I have created. Before meditation, I had this mental tape that I was not an artist. And only artists did artwork. However, as I began to watch my thoughts and come to that Awareness that is beyond all definitions and judgments, I became free to explore and experiment. Like my writing, my art seeks to bring about a peaceful sense of mind for the viewer and to activate one's spiritual imagination. 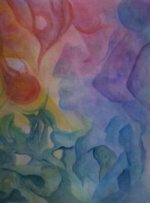 Most of the images in my paintings arise out of playing with colors and being in a receptive state. Out of the formless comes form. 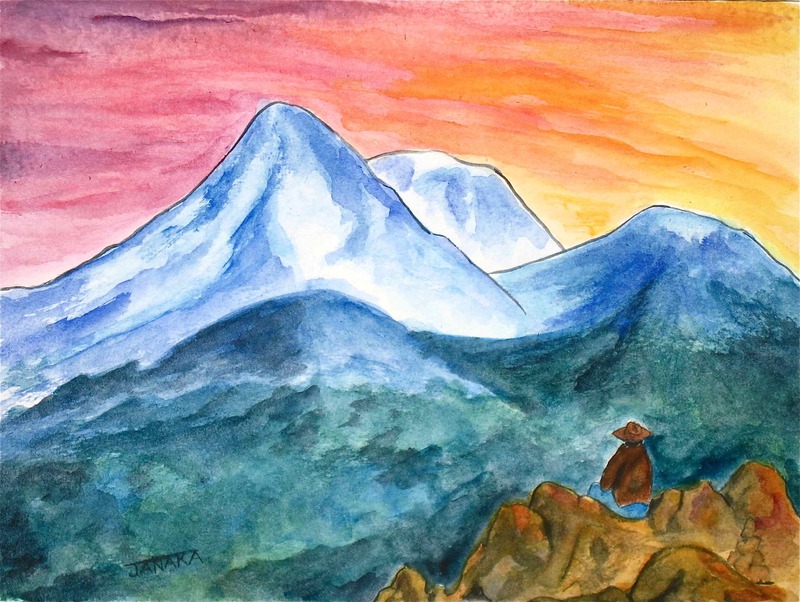 To see Janaka's original artwork and prints for sale, click on the above picture.